Apply now for a PSBank Auto Loan through the latest addition to the Bank’s digital offerings, the PSBank Online Auto Loan Application (www.psbank.com.ph) because great deal awaits you. 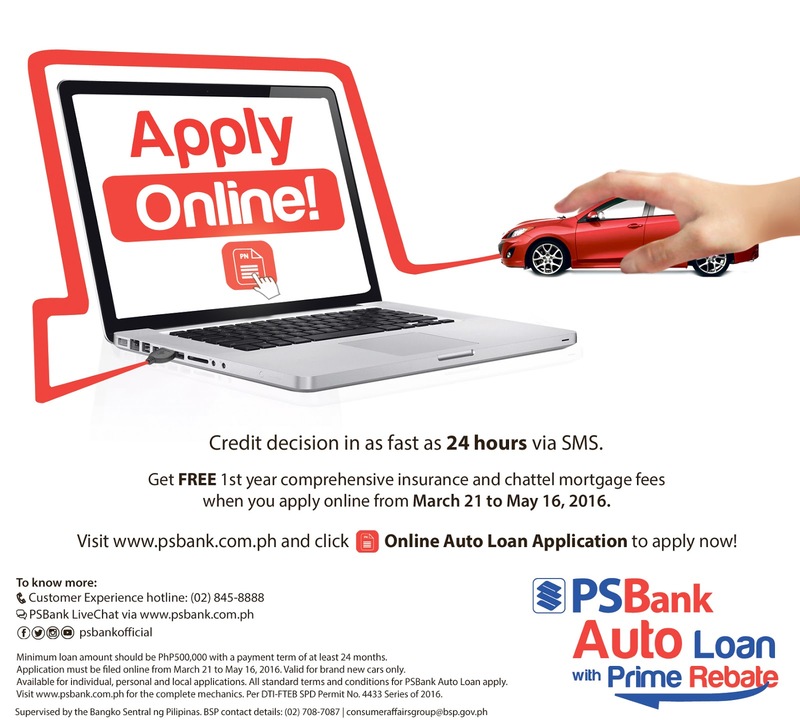 Individuals who will apply for a PSBank Auto Loan through PSBank Online Auto Loan Application from March 21 to May 16, 2016 will get a free comprehensive insurance on the first year and free chattel mortgage. You just simply avail of an auto loan to at least PhP500,000, to be paid within a minimum 2-year period to enjoy PSBank’s freebies under this promo. Approved loan applications must be booked no later than 10 days from the last day of the promo period. PSBank recently launched the PSBank Online Auto Loan Application, speeds up the loan approval process as clients receive via SMS a credit decision within 24 hours from the time of their application. This online platform is available for individual and local PSBank Auto Loan applications.